A fierce wildfire racing across Northern California has destroyed parts of the Sierra foothills, including one town, officials say. The so-called Camp Fire, which started early on Thursday near Camp Creek, has been fuelled by strong winds and dry forest. Some residents in the town of Paradise, which was "devastated", were trapped by the flames, state fire officials said. Thousands in the region have evacuated, including from schools and hospitals. There are unconfirmed reports of casualties, which an official said could take days to confirm. "[Paradise] is devastated, everything is destroyed. There's nothing left standing," said Scott Maclean, the state's forestry and fire protection spokesman. 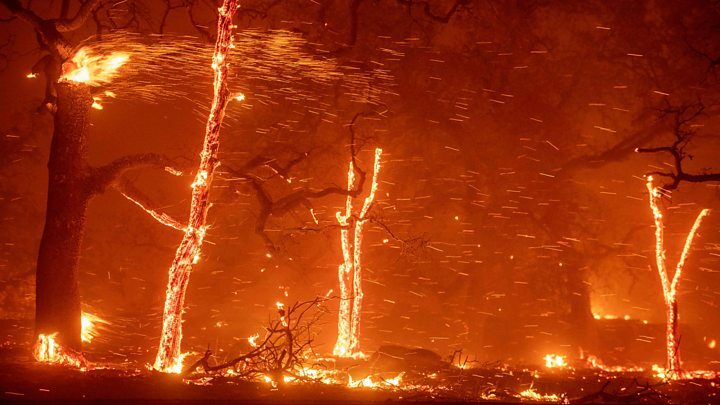 The Camp Fire had burned through 20,000 acres as of Thursday afternoon, local time, according to California Fire officials. As winds approached 50mph (80km/h), causing the fire to grow rapidly in just a few hours, some residents were forced to abandon vehicles and escape on foot, local media reported. Further south in Ventura County near Los Angeles, strong winds are preventing efforts to tackle another massive blaze - a few miles from the scene of a mass shooting in Thousands Oaks that claimed 12 lives on Wednesday. The second wildfire is said to have scorched 10,000 acres, according to officials. Evacuation orders are in place in northern California for the town of Paradise, home to around 26,000 people, as well as Magalia, Concow, Butte Creek Canyon and Butte Valley areas. Emergency crews are working to rescue residents trapped there, an official said. At least one nursing home and the Feather River Hospital were evacuated and several homes were on fire, according to the Sacramento Bee, and the region is covered with thick, dark smoke. A spokesman for the hospital operator, Dignity Health, reportedly told Action News Now that Feather River was later destroyed. Thousands are also without power in the region, which is just north of Sacramento. One Paradise resident who fled the encroaching blaze told the Bee: "It was so hot. You could feel it." Others described watching flames consume their property as they evacuated. The blaze is one of 14 currently active in California. Officials have put most of Northern California is under a Red Flag Warning, which means "extreme fire behaviour" can occur within 24 hours. On social media, many have been sharing images of highways and roads flanked by fire or covered in heavy smoke and asking for help to evacuate friends and family. Resident Shari Bernacett told the Associated Press that she "knocked on doors, yelled and screamed" to get mobile home residents to leave as fire consumed the hillside. "The whole hill's on fire," she said while crying. "God help us!" The region has grappled with serious wildfires - including the worst in the state's history, the Mendocino and Thomas fires - on and off since 2017.